3D Printing is this years buzzword; a brand new way of thinking about how mainstream products are created and manufactured. It was even referenced by President Obama in his Feb 2013 State of the Union address. He said, “3D printing that has the potential to revolutionize the way we make almost everything”. True, 3D printing is pretty unique in that it truly allows the creative process to actuaize itself going from concept to product with a push of a button (and some technical stuff). British shoe designer Kerrie Luft is using this technology to blend style with 3D printing. 3D printing might be really hot right now, but it’s not that new to Kerrie Luft. She first came to public attention in 2011 when her line of shoes won the British Fashion Fringe award; all featuring heels that were 3D printed. Luft is now looking at launching her own line of shoes- and with support from mentors such as Lulu Guinness and Patrick Cox (who she interned with) it looks like she’s on to a winner. There’s far more to her work than the novelty that she’s utilizing 3D printing– her shoes are beautiful creations that intertwine art nouveau elements with fierce titanium accents. Her new collection is entitled ‘Nouveau’ and is currently on display at Selfridges, London, who bought her collection outright, for an undisclosed amount. She creates her designs by blending modern shoe techniques with the EOS 3D laser sintering process, which lets her work with materials such as metal and plastic. 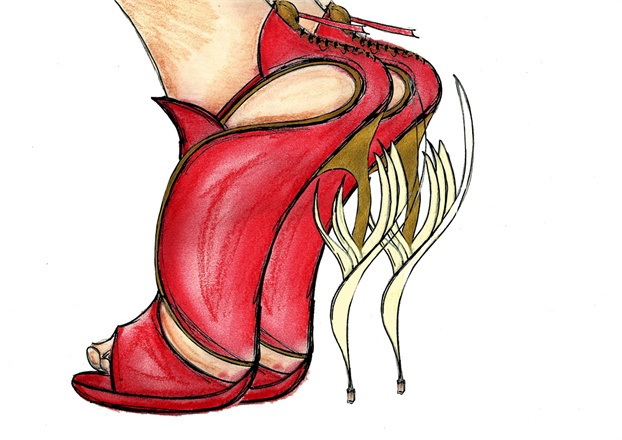 She learnt many techniques whilst at the London College of Fashion where she undertook an MA in Fashion Footwear. 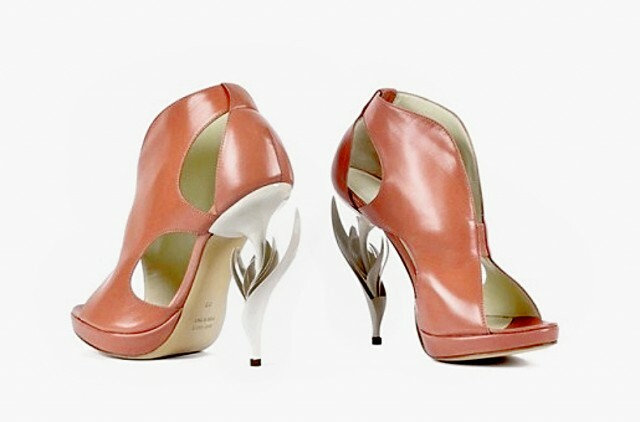 Kerrie came up with the concept of 3D printing heels there, and told told FashionSalade about her inspiration. “I first came across the technology while studying for an MA in fashion footwear at London College of Fashion. I was trying to create a specific heel shape for a project I was working on and I was introduced to The Fashion Digital department where I learned about 3D Cad and 3D Printing. Every young designer dreams they will connect to the latest trend, and Kerri Luft is three steps ahead of the 3D printed game. 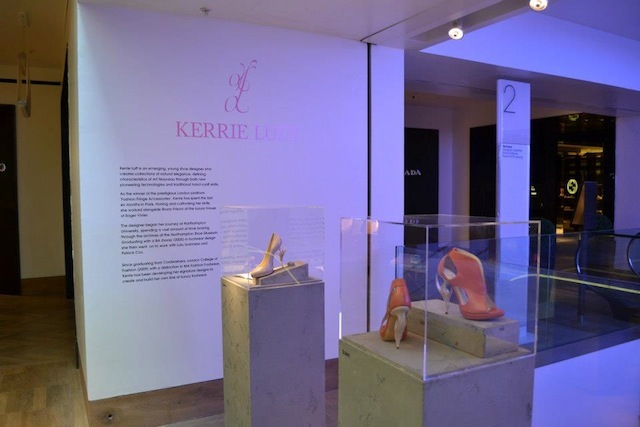 It’s a pretty big deal for a young designer to be heavily featured in Selfridges, and Kerri was given a large space on their Shoe gallery to show her creations off. 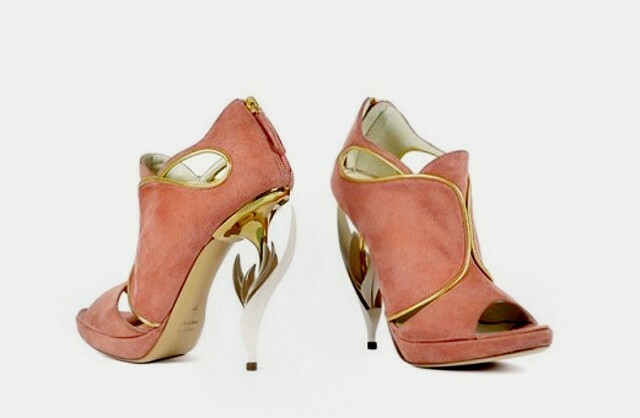 “I am extremely excited to see my shoes displayed in the Shoe Galleries at Selfridges. The team at Selfridges have been really supportive, offering advice and direction in the building of my first range,” she said.